Atom Ant is a cartoon character created by Hanna-Barbera, It originally costared in The Atom Ant/Secret Squirrel Show. First aired in October 2nd, 1965 on NBC, lasted for 2 seasons with a total of 26 episodes of 30 minutes. 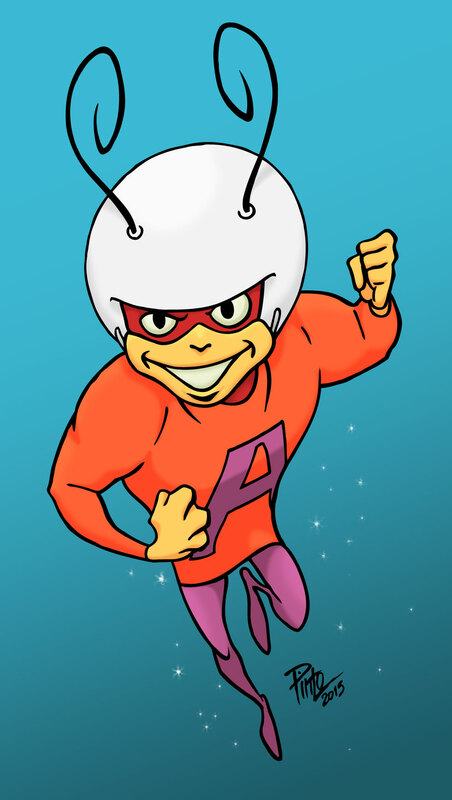 Atom Ant was able to fly, had super strenght, speed and invulnerability. I can still remember his catchphrase Up and at ’em Atom Ant! in brazilian portuguese, from the time I actually watched the cartoon, some time around the 80’s: Lá vai a triônica, Formiga Atômica! The character appeared in many other shows from Hanna-Barbera and you could probably see him in some crazy Cartoon Network show or rerun.